Chumley spurned Clemson to play the defensive line at UGA. Editor’s note: This continues a regular feature on DawgNation called “Throwback Thursday.” It offers the chance to revisit the recruiting stories of former UGA greats. The last few installments were on 1988 All-American RB Tim Worley, all-time punt returner Damien Gary, crowd favorite RB Musa Smith, all-time leading receiver Terrence Edwards and tackling machine Tony Gilbert. This week’s feature catches up with a great Bulldog in the trenches from Savannah. That’s the way folks around Savannah Christian address their head football coach when they need to get a word in. That’s Donald Chumley to the rest of the world. The former UGA standout is the head coach at a private school powerhouse that has won 80 percent of its games on his watch. Look around the walls of his office and you’ll see treasures from a Savannahian who starred at nearby Groves High and wound up at UGA. There are pictures of big games and spring football and postseason honors. 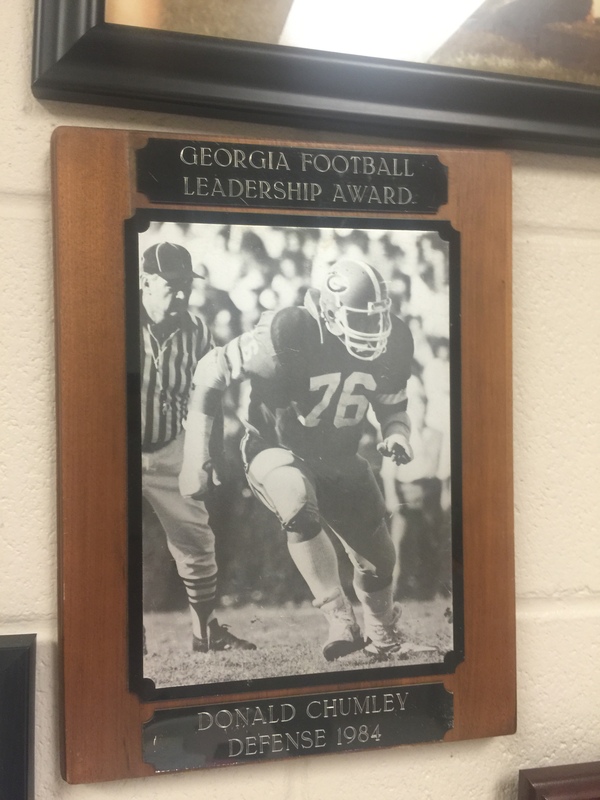 There’s also a plaque signifying Chumley earned the “Meanest Mother” award during his years at UGA. Anyone who has ever strapped on a helmet would appreciate an award like that. The 6-foot-4, 265-pounder was committed to Clemson but wound up at UGA. How did that happen? His answer to that question will be hard to forget. But his father Lanier Chumley added one last detail about that decision. That’s why he bypassed Clemson and the chance to play for Danny Ford back in 1981. Ford had him all but reeled into the boat. “It was important to me to have my Daddy’s support and that’s why I ended up driving to Georgia rather than walking to Clemson,” Chumley said. Chumley got to know Ford well. Chuck Reedy also recruited him heavily. Chumley is 104-26-1 in his 11 years at Savannah Christian. 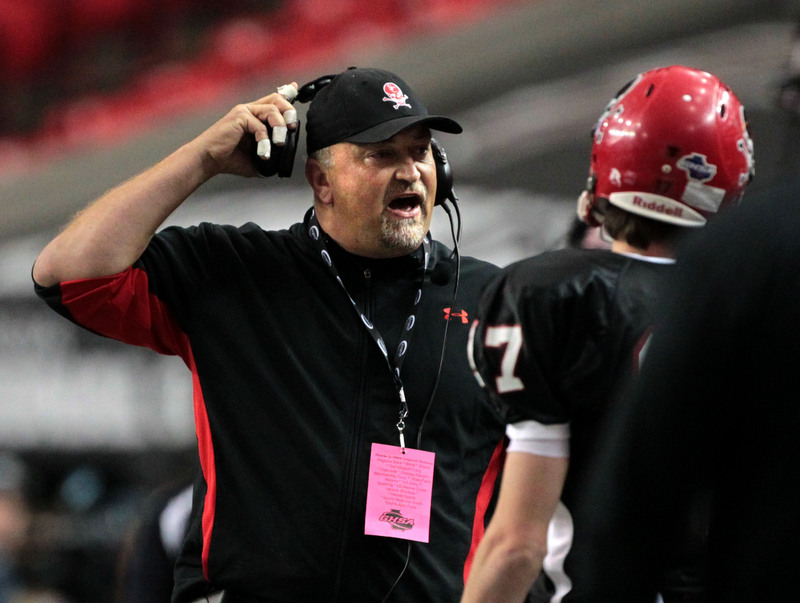 His teams have played for the state title on three different occasions. The Raiders won it all in 2011. The defensive captain of the 1984 team said the biggest thrill of his recruiting process was a phone call. Chumley was getting boxed out by his father to the phone. He wanted to talk to coach Bryant, but not before his father had his say. 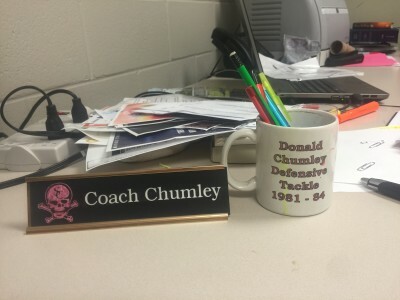 Chumley has a bit of advice for recruits that play for him. He’s got players at Louisville and Minnesota. He’s also sent players to Georgia and to Wake Forest in his career. UGA target Demetris Robertson plays for him now. Robertson is a 4-star prospect and he’s rated as the No. 2 athlete in the country in the Class of 2016.